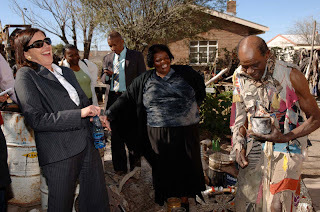 It was quite a happening when the Deputy Minister of Foreign Affairs, Ms Sue van der Merwe, met with politicians, officials and community representatives of the Central Karoo District Municipality and the Prince Albert Local Municipality at Prince Albert Road on 13 September 2007. Sue van der Merwe is the political champion of the Central Karoo in the National Government and came to learn for herself about the obstacles faced by communities living in Transnet-owned houses dotted along the mainline railway line throughout the region. Just across the railway line at Prince Albert Road station is a cluster of 18 small, neat red-brick houses, many of whose inhabitants recall with affection the days when their station was busy and efficient providing them with a livelihood. Most are former employees of Transnet, who were retrenched when the company restructured in the early 1990s. Transnet now wants to dispose of its “non-viable assets”, such as houses, and in the case of Prince Albert Road, has offered to transfer them at very low cost to the Prince Albert Municipality. Deputy Minister van der Merwe told community leaders that she wished to work with all of them to overcome the blockages faced by Transnet settlements. Obviously the people of Prince Albert Road do not expect miracles, but certainly hope that her visit will speed up decisions about their future.